The U.S. woke up this morning to a North Korean Summit surprise, but not the one we expected. Instead of burst-tweeting, friend-of-autocrats Trump — the one we’ve seen though most of his presidency — we got the Art of the Deal Trump, who knows when to walk away and can do it without burning bridges. “Sometimes you have to walk,” Trump explained at a press conference before leaving Hanoi. 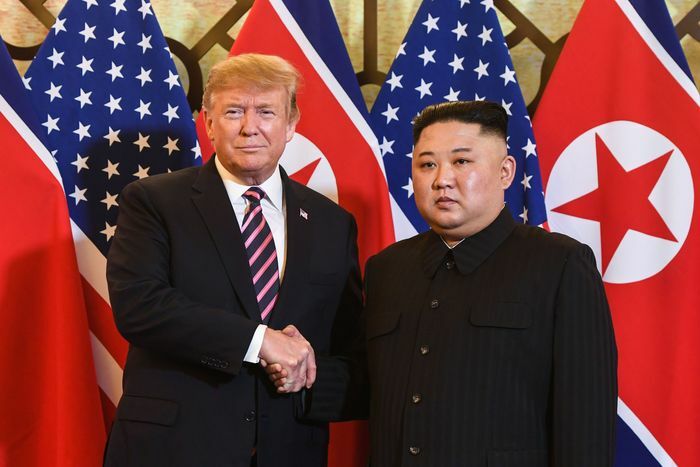 His announcement that he and North Korean leader Kim Jong-un had cut short their summit when it became apparent that an agreement was not in reach — because Kim wanted all sanctions lifted and wouldn’t agree to close all his nuclear weapons program in exchange — drew praise from the left and the right. Trump’s next step was also shrewd: calling South Korean president Moon Jae-in from Air Force One to ask him to take the lead in further efforts with Kim. The South Koreans said Trump “asked President Moon to actively perform the role of a mediator that may entail talking with Chairman Kim and letting him know the outcome of his dialogue.” This calms Moon, who has staked his own political survival on the process moving forward, and may provide some incentives for North Korea to keep talking. It also, of course, gives Trump someone else to blame if progress does not ensue. So now we’re just waiting to see what happens next with two volatile, nuclear-armed actors. Does Kim revert to bad-boy provocations? Or does he decide he is best placed to play the statesman, keeping up talks with Washington, and trying to achieve actual progress with South Korea on issues of concern to them both — all while he builds closer economic ties with China, Russia, and others to wear away at the sanctions. Kim doesn’t want to be China’s puppet any more than he wants to be Washington’s — but Beijing wants Pyongyang to be economically healthy and independent. And Moscow, which tries to insert itself into North Korean affairs every few years, is eagerly looking for opportunities to embarrass Washington and disrupt its alliances. And what do we know about Trump’s next move? Keen observers noted that Trump’s North Korea envoy, Stephen Biegun — who recently made the case for a steady, slow, and mutual move toward de-nuclearization — was not present at the major summit dinner. It’s an odd choice that seems to signal he is not a key Trump adviser and may limit his future effectiveness. Washington still has cards — the lifting of sanctions, a declaration ending the Korean War, the removal of some or all troops from the Korean Peninsula — that Kim badly wants. But those cards just got harder, not easier, for Trump to play. If I had to guess, the president now understands that Kim is not budging, and this exercise has run its course; the president said upon his departure that a third U.S.-North Korea Summit would be a long time coming. But the thing to worry about is North Korea’s long history of refusing to be ignored, and rattling every tool in its arsenal, including the nuclear ones, to ensure that it is not. If Kim decides he needs Washington’s attention, or he needs to up the ante for sanctions relief, he is all too free to go back to building weapons — or testing them.